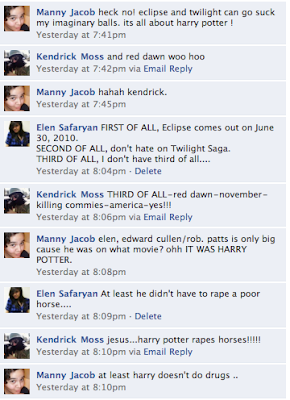 I think compared to Twilight, this book is better. It is kind of shorter and the print is larger. So anyways, the last time I was in school was Wednesday. Last week. So this is the fifth day of my sickness and third day of absence. Yeah, I didn't go to school on Thursday, Friday, and Today. Probably tomorrow, too. I need to go back to school on Wednesday. I have shitload of stuff to make up. And by "stuff" I mean History, and by "shitload" I mean 4 homeworks, 1 chapter quiz, and a map test. YES. MY HISTORY TEACHER GIVES US LOTS OF HOMEWORK. But, amazingly, I can point out location of Hyderabad with closed eyes. Somewhere in southeast of India. So I'm sick. I think I have Mono. Probably got it from my cousin. Who got it from her roommate. Who got it from her boyfriend. Who got it from his lover. Who got it from a random guy in the party. 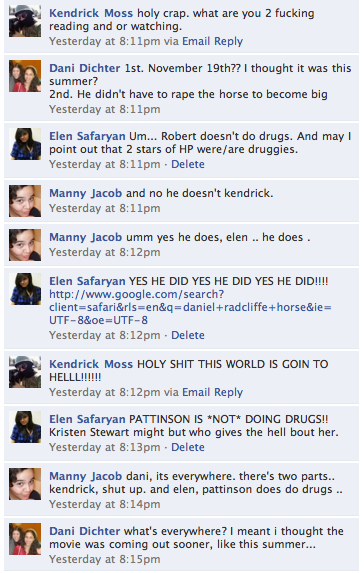 If you didn't read New Moon, you probably don't know what it is. Har har. I mean, remember, that's what Jacob "had" when he was transforming. If you read it, you know it as a disease transformed from kissing.. But it is also transformed from drinks, food, cigarettes, and so on. Me-Cousin-Roommate got it from drinks/food. I sipped some Dr. Pepper from my cousin. She ate with her roommate's fork. Roommate-Boyfriend-Lover-Random Guy got it through kissing. THANK YOU VERY MUCH, USC!! I had the most random nose-bleedings yesterday. Imagine, you wake up, and out of nowhere your blue pillow becomes red. (you can't bleed while you're asleep, so me body woke me up. Which is sad. I had a good dream). Or you sit in your comfortable office-chair, legs on the table, argue with your friend on facebook whenever Robert Pattinson is better than Daniel Radcliffe, and out of nowhere your white letters on your Macbook keyboard become red. Icky, trust me. Today -- so far -- no accidents like that. 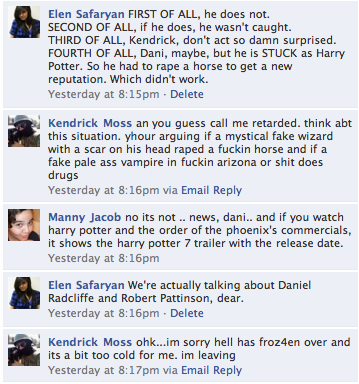 Oh, back to the facebook argument. A little sneak-peek on what happened. It is 119 comments long, so I will save your time and just post from where Kendrick came in and then left. Yeeeeah..... we are crazy people out here in LA. My mom just called me. She asked to turn on radio on 104.3FM. Her favorite song was playing. She said a guy and a girl are singing it, but she couldn't remember the lyrics and music. by Justin Bieber and Ludacris. I also realized that I forgot to delete all numbers from our old phone that we returned back to Costco. That means some creeper might call us. EEEEK. Me: Mom, did you delete numbers from Phonebook before you returned out Home Phone? Mom: .... O_O Oh, crap.